The Acer XG270HUA is a staple choice when it comes to gaming monitors with a QHD screen that has higher refresh rates and low input lag. This model has been around for some time due to its excellent specs and performance with a very reasonable price in its bracket. There aren’t many like the Acer XF270HUA which comes with an IPS, but let’s check out if this is a practical winner based on its capabilities. The Acer XF270HUA uses the brand’s age-old aesthetic design which it used on some of its pioneering gaming offerings. There are many models in Acer’s line that looks almost exactly the same, so make sure to check that the one you are buying has the letter A (Abmiidprzx) initial at the end of the variant name. This monitor is bezel-free on three sides, but it’s still a dual-stage design which means there is an inner panel border. What we love about the Acer XF270HUA is its slim proportions which offer a subtlety that is missing from today’s newer models. The rear bulge is minimal so mounting should not be an issue, while the chassis’ thick plastic panels provide an excellent feel of durability. We did not notice any creaking or unwanted flexing on the review unit, indicating that Acer used premium materials for this model. One of the few things we dislike on the Acer XF270HUA is its use of OSD buttons which feels ancient and troublesome in the dark. However, this variant is just a refresh so its understandable that most of the design features are carried over. We wish that Acer also updated this part with a joystick for easier OSD manipulation. 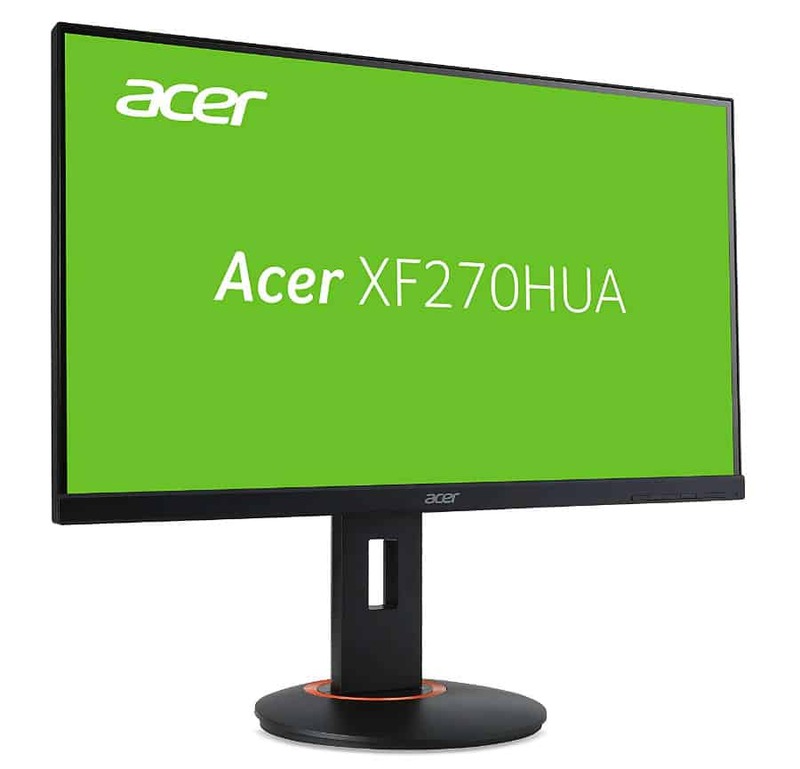 The Acer XF270HUA is a FreeSync gaming monitor, so it does not come with connectivity restrictions like its G-Sync counterpart, the Acer XB271HU. The panel at the rear includes DisplayPort 1.2, HDMI 1.4 and 2.0, and a DVI-DL slot for older machines. There are a total of five USB 3.0 ports which you can utilize for accessories and peripherals such as keyboards or thumb drives. 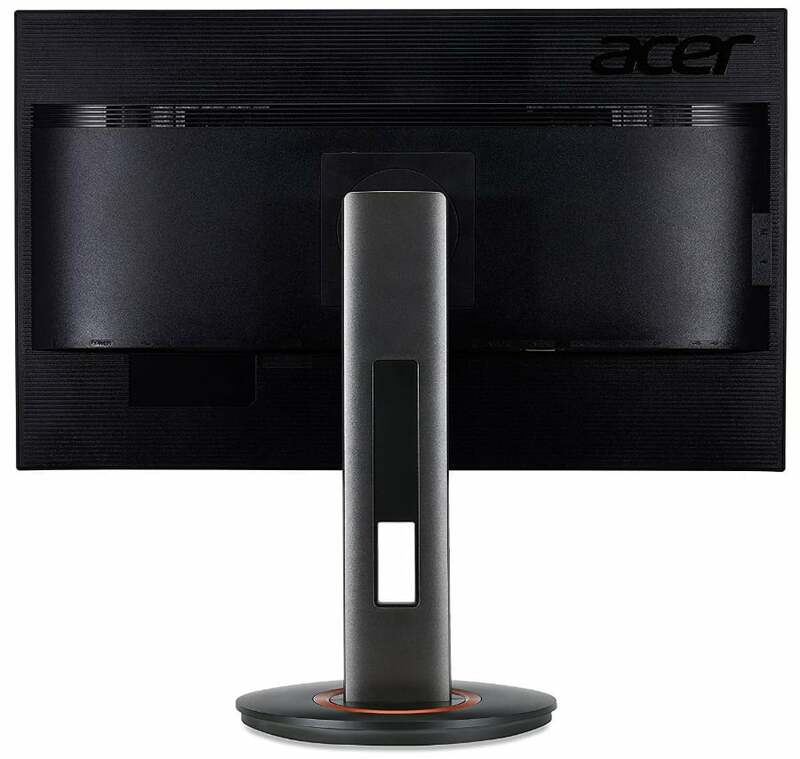 The included stand provides excellent stability to the Acer XF270HUA while also giving it a lot of room for adjustment. You can tilt, swivel, pivot, and adjust the height of the screen so pretty much any orientation or setup is doable. You can also remove this part to reveal VESA holes which are compatible with 100 x 100 adapters that are common anywhere. The base has a nice weight to it which prevents the Acer XF270HUA from toppling over to the rear. The round shape makes it look dated, but what matters is it does its job and helps users avoid physical damage to the device. The Acer XF270HUA sports a 27-inch IPS panel with a 2560 x 1440 resolution, 144Hz refresh rate, and 4ms response time. An edge-lit backlight with a 300cd/m2 and a contrast ratio of 1000:1 is also included with the package, as is typical with most IPS monitors. This type of display is highly sought after by gaming enthusiasts, but most are offered with G-Sync which makes them more expensive. 1440p at 27 inches is a sight to behold especially if you are coming from a 1080p display. The faster refresh rate only makes it better, combining both sharpness and smoothness in a single package. 1440p is the sweet spot between the characteristics mentioned above, while IPS with a high refresh rate is preferred by gamers who also do editing and content creation. The Acer XF270HUA posts fantastic image results despite minuscule shortages in gamut coverage. The panel scored 97% sRGB volume with a brilliant out of the box accuracy of Delta E 1.33 which is superb for a gaming monitor. If the display had more vibrancy, this model would have been excellent for photo editing and gaming at the same time. The screen’s color temperature sits close and comfy to the ideal 6500K, giving users a well-balanced image that is neither too warm or cool. One tricky aspect of the monitor is its gamma since the settings in the OSD have a noticeable offset. Setting the screen to the 2.2 option looks more like 2.4, but lowering it 1.8 gives off 1.6. The IPS panel on the Acer XF270HUA reaches a very high contrast of 1200:1, which to be honest, is required for IPS panels so they can counter the grayish hue of blacks. This model has excellent black levels for an IPS monitor, although some images with darker colors still look washed out when viewed in the dark. The monitor’s brightness reaches up to 380cd/m2 which is great for daytime use as well. Panel uniformity is excellent, and we did not notice any clouding the Acer XF270HUA. There are a few leaks at the corners, but they are too weak to affect the nearest quadrants in both color and brightness. The only time the bleeding will be noticeable is if the screen doesn’t have anything to display or if you are viewing a full-black image. Motion handling isn’t an issue with the Acer XF270HUA since blurs are minimal even when the screen’s overdrive is turned off. We recommend choosing the normal level if you still see some unwanted smudging or trailing in fast-paced action. The extreme level adds noticeable overshoot, so it would be wise to stay away from that. The Acer XF270HUA is a FreeSync gaming monitor with a functional range of 40Hz to 144Hz which is excellent for AMD GPU users. This model isn’t tested to be G-Sync compatible, but some users reported that it does work with their RTX GPUs. Input lag is limited to 10ms, ensuring that your aim is always on point without any delays. The Acer XF270HUA is a fantastic gaming monitor with an IPS panel for the price which isn’t as bloated as it is on the XB271HU. Image quality has a few shortcomings, but they are mostly forgivable if you consider the specifications and capabilities of this display. 1440p 144Hz is still the sweet spot for enthusiast gaming since 4K 144Hz is still expensive to run. You can push the Acer XF270HUA’s output even more, but it would be tricky without a handy colorimeter since the gamma settings are a bit off. Gaming performance is superb especially when it comes to input lag and motion handling. The Acer XF270HUA is a great choice if you need an IPS gaming monitor and would rather not shell out the extra cash for its G-Sync counterparts.